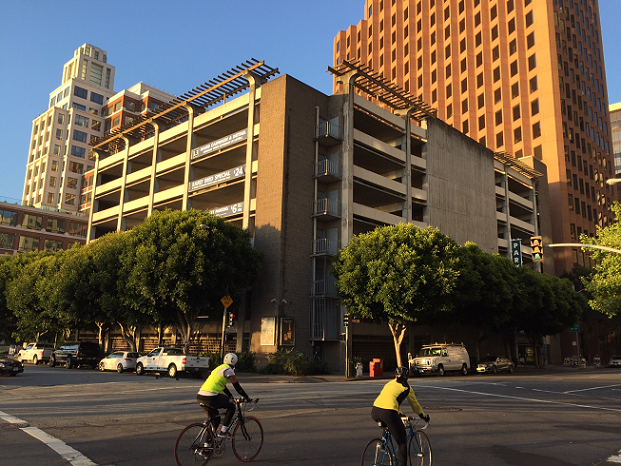 San Francisco has a lot of projects going on. 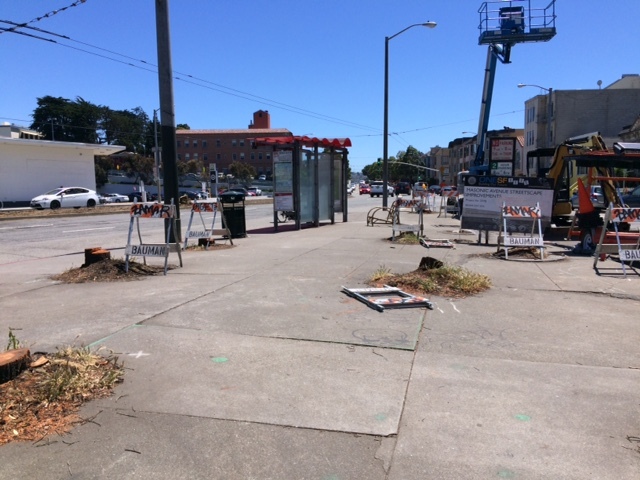 SFMTA seems to be flush with wealth, and is “improving” a lot of roads. Developers are planning fancy new buildings. 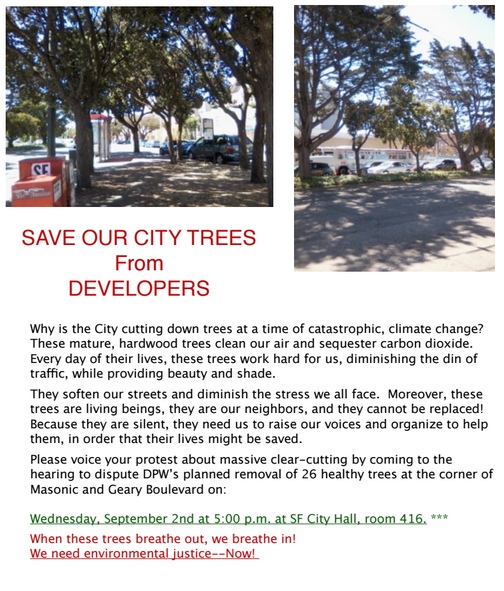 Unfortunately, every project seems to start with destroying trees – and neighbors never know about it until it’s a done deal and the trees have 30-days-to-death notices on them. Then they object… but the odds are against them. Though they sometimes succeed in saving the trees, more often it’s too late. Meanwhile, the City seems to be entirely accepting of tree destruction for any and all reasons. 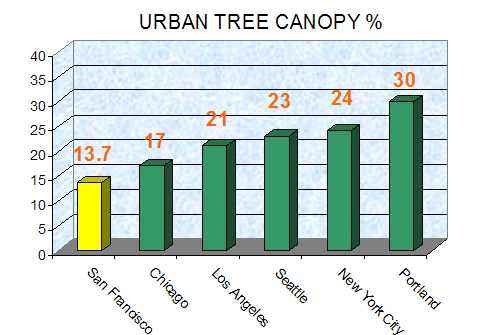 San Francisco has a tree canopy of only 13.7%, the lowest of any major city, and nearly half the appropriate canopy cover of 25%. This is an embarrassment for a “green” city, quite aside from the ecological, environmental and health reasons for saving our trees. 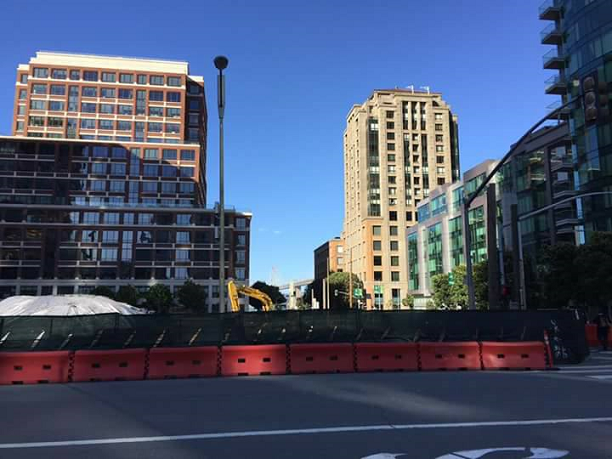 Unfortunately, between Nativists, developers, and project managers, there seems to be a wave of tree cutting hitting San Francisco. We’re not augmenting our canopy, we’re shrinking it. 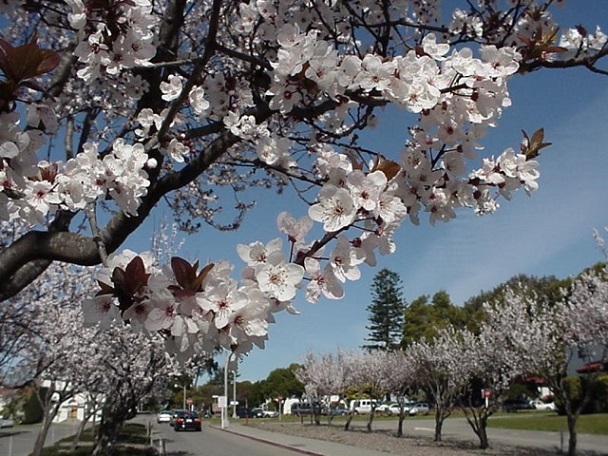 Trees fight pollution, especially particulate pollution that is dangerous to human lungs. Trees are good for physical and psychological health; to get the same benefit as living on a tree-lined street, you would have to be ten years younger. Trees provide habitat for wildlife, especially birds and butterflies. Trees help regulate water by absorbing it into their roots and gradually releasing it through their leaves. Trees reduce crime and improve business. 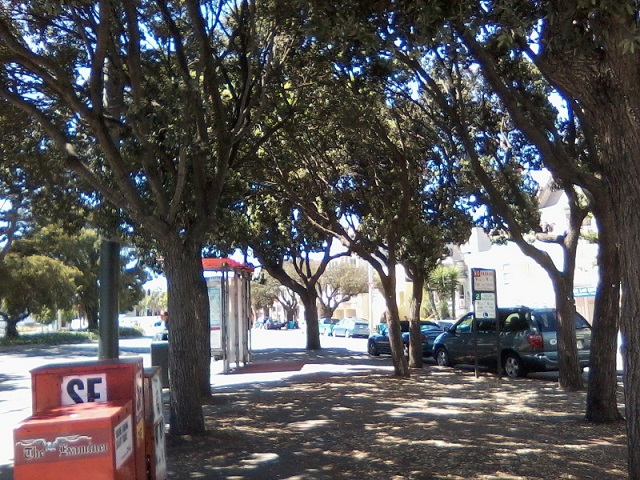 Two years ago, neighbors fought to save this lovely grove of trees at Geary and Masonic. They were cut down because of plans that merely considered them as “green things that are in the way” and were not designed to preserve them. 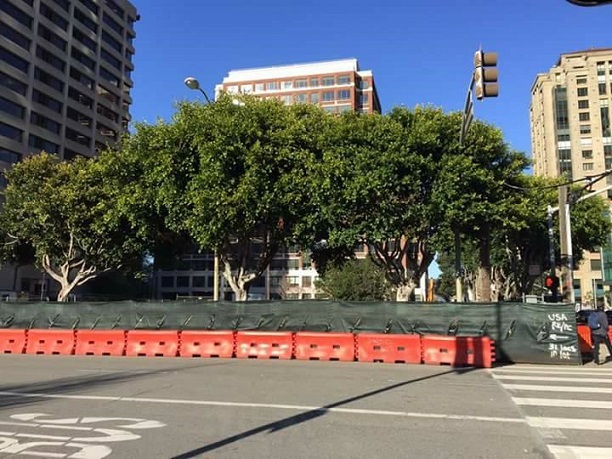 This charming line of street trees, fighting pollution and climate change, and breathing out oxygen in downtown San Francisco, is also gone. In its place there will be a tower block with a footprint out to the sidewalk. Where once there were trees. Plum trees the neighbors loved were removed at Fort Mason, leaving the neighbors in shock. The tree destruction continues, but in some cases at least it may be possible for neighbors to prevail. 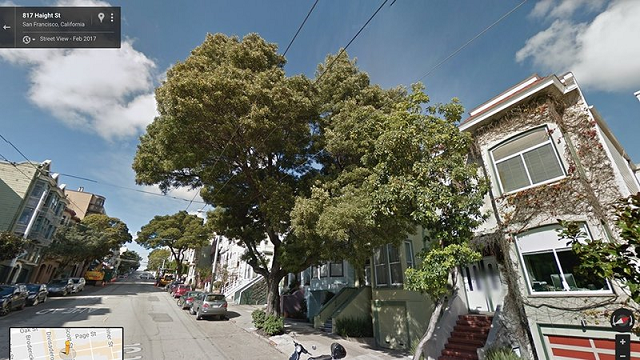 Neighbors are seeking to save this tree, one of the few large shade and habitat trees remaining on Haight Street. It’s disrupting the sidewalk, but an arborist has determined that the tree can be saved simply by enlarging the tree basin to accommodate its roots, fixing the sidewalk, and pruning some of the branches. 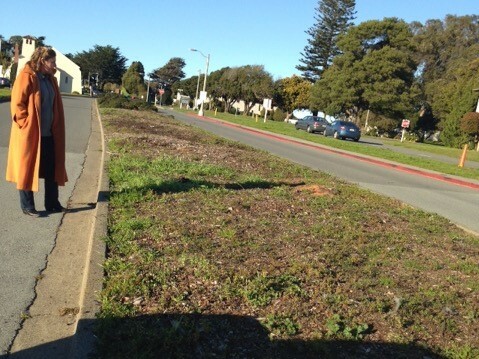 The San Francisco Forest Alliance is acutely aware of the value of Green Infrastructure, and we support the efforts of neighbors and neighborhood groups to preserve non-hazardous trees. Loved this email. Just donated $100.